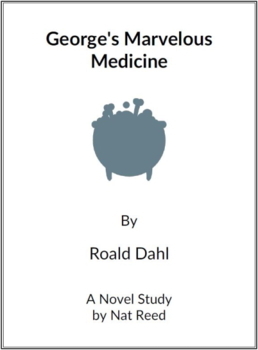 George's Marvelous Medicine is a comprehensive 49 page novel study guide. The guide is presented chapter-by-chapter and includes the following distinct sections: Before You Read, Vocabulary, Comprehension Questions (including many higher-level thinking questions); Language and Extension Activities. The novel study includes everything needed to teach the novel including the following concepts / activities: setting, literary devices, research skills, cloze activities, creative writing assignments, character studies, parts of speech, synonyms, crossword and word search puzzles, studies in conflict, constructing a storyboard. Numerous links with the Common Core Standards. The writer of this novel study has had more than 60 curriculum units published. To check out a similar Novel Study written by the author, download the free copy of "Island of the Blue Dolphins" available at Teacherspayteachers.